Deep thought on this Sunday: What if they had called blueberries “purpleberries”? Every time I mash or cook a blueberry and I see the purple inside, that’s what I think. It’s almost like I resent them for being called blueberries. Because it’s almost like false advertising. Sure, they’re blue on the outside, but aren’t we taught that it’s what’s on the inside that counts? 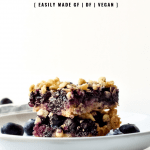 What if this recipe were actually called Purpleberry Oatmeal Bars? It sounds like something straight out of Willy Wonka. But I guess we have plenty of oddly named fruits: dragon fruit, kumquats, boysenberries. And breadfruit – IT’S NOT BREAD, PEOPLE. FFS. 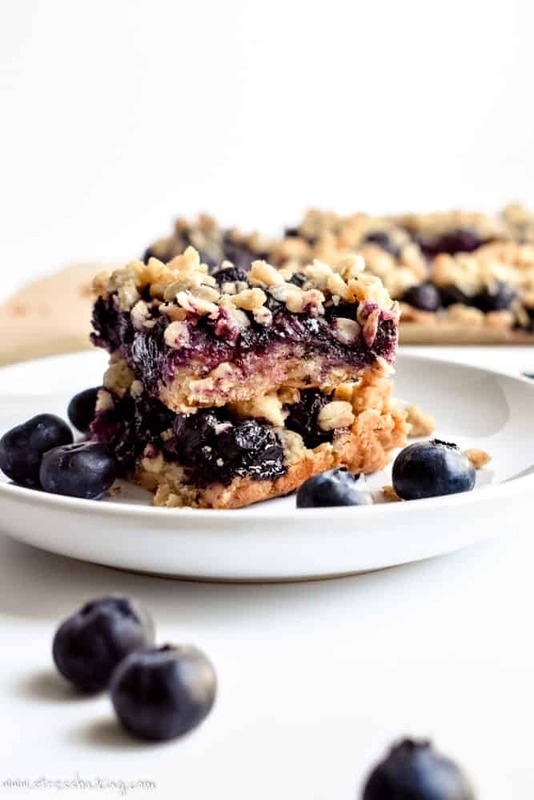 Depending on where you live, you might be looking at this recipe thinking to yourself, “Leslie, it is not yet the appropriate time for me to go blueberry picking and now you have made me sad”. Fear not! 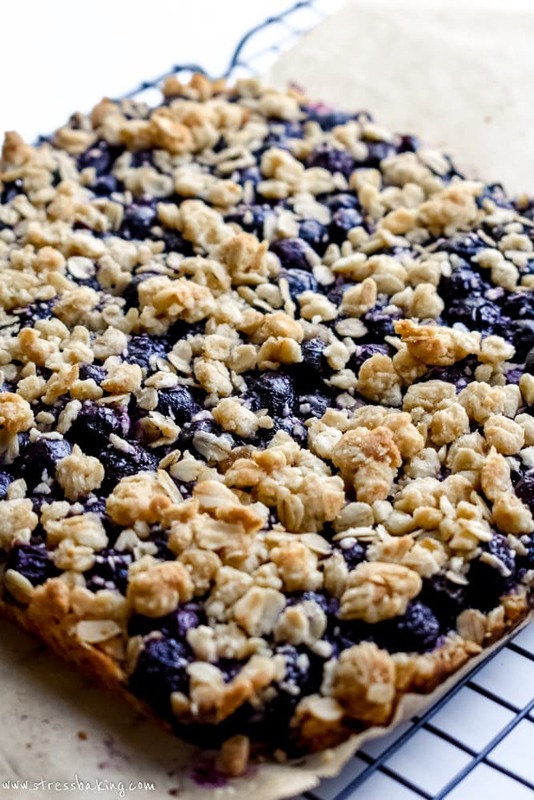 I usually make these with frozen blueberries and they are equally as delicious. So just grab a bag out of your store’s frozen section and you’re all set. If you can make this recipe as is, fabulous! Easy peasy. But if you have dietary restrictions, or maybe your pantry is just lacking in the right ingredients, there are some substitutes you can make without it getting complicated. Don’t have fresh blueberries? Just grab some frozen ones! All you’ll need to do is thaw them, rinse them and drain them before using. Gluten free? Use gluten free oats and gluten free flour instead. I like to use Bob’s Red Mill Gluten Free Organic Old Fashioned Oats (affiliate link) and Bob’s Red Mill Gluten Free 1 to 1 Baking Flour (affiliate link). Dairy free? Swap out the melted butter for some melted coconut oil – same amount. 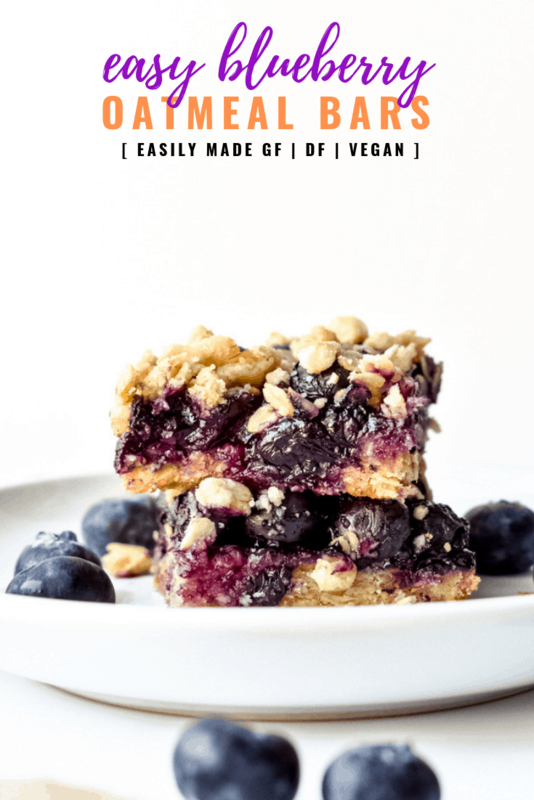 These blueberry oatmeal bars have taken me quite a while to get right – I’m always surprised at how much even a 1/2 teaspoon of an ingredient can throw off the whole thing. I wanted the base to be chewy, buttery and sturdy enough to hold the filling. One time I used too much butter and it spread too much and never cooked through. Another time I tried a 1:1 ratio of oatmeal and flour, and the crust was too thick and seemed dry. I had tried to avoid adding sugar, but it needed it for the right flavor. And the 1/2 teaspoon of pure vanilla extract is what really brought it all together for me. I had also tried making the crust and crumb topping as two separate things, with two different sets of ingredients. It was entirely too complicated, and didn’t need to be. Using the same thing for both works out perfectly. I also wanted the filling to be freshly made and not some canned pie filling – but I struggled with getting the right mix of ingredients for a long time. An embarrassingly long time. Additionally, I knew I wanted lemon juice and zest in there, because blueberries + lemon = <3. But the amount of liquid that the lemon juice added really screwed me up. Blueberries get super juicy when they cook, and I just couldn’t get the ratios right. The key to my eventual success was the right amount of cornstarch. Too much and it was weirdly gelatinous. Too little, and the filling was too wet and the bars just fell apart. One teaspoon was just right. 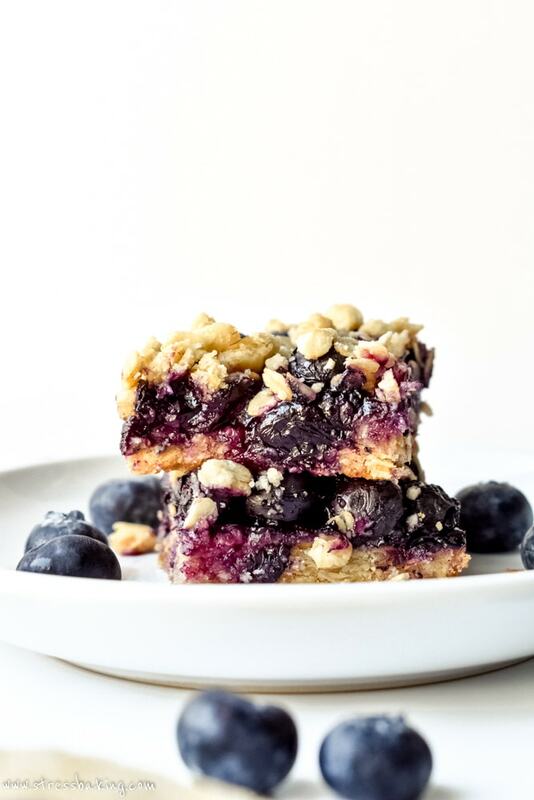 I haven’t tried to make these in a 9 x 13 dish, but I would imagine if you doubled the recipe you’ll just end up with slightly thicker bars as a result. I also have not tried making these with a mix of berries, but I’m aiming to soon. I’m thinking blueberries and blackberries, with a little extra lemon zest. Or maybe I’ll make a 9 x 13 dish that’s half and half. 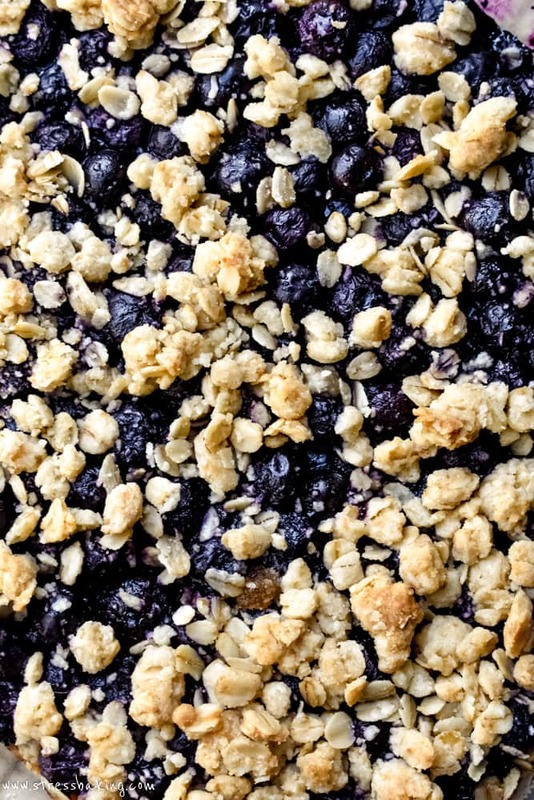 Or maybe I’ll just double all the things, still bake it in an 8 x 8 dish, and make monstrously sized blueberry oatmeal bars that may or may not be a huge mistake. I’ll report back later. These. Are. SO. GOOD! I, too, love blueberry and lemon together. Great recipe! OMG I am a blueberry lover. These bars look fantastic. I know my hubby would LOVE these too. What a great dish to take along to a party. That topping is calling my name! I am going to get some blueberries real soon and make this! Haha I’m going to hear “purpleberries” in my head every time I see a blueberry now! 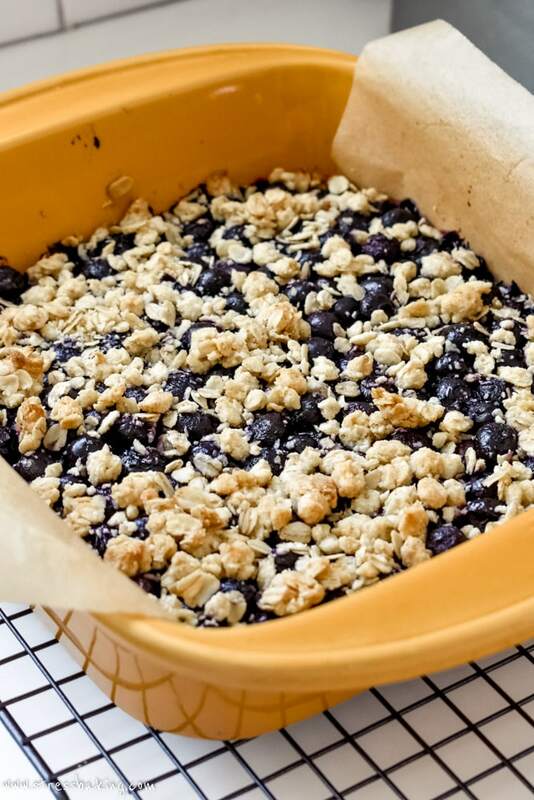 I love how there isn’t a lot of sugar in this recipe, so I won’t feel guilty eating this for breakfast (or feeding it to my toddler, who loves blueberries!). Thanks for the awesome recipe can’t wait to try it! You are very clever with your fruit names!! I think you should start your own book and rename everything. I am such a fan of blueberries. They go so well with everything. 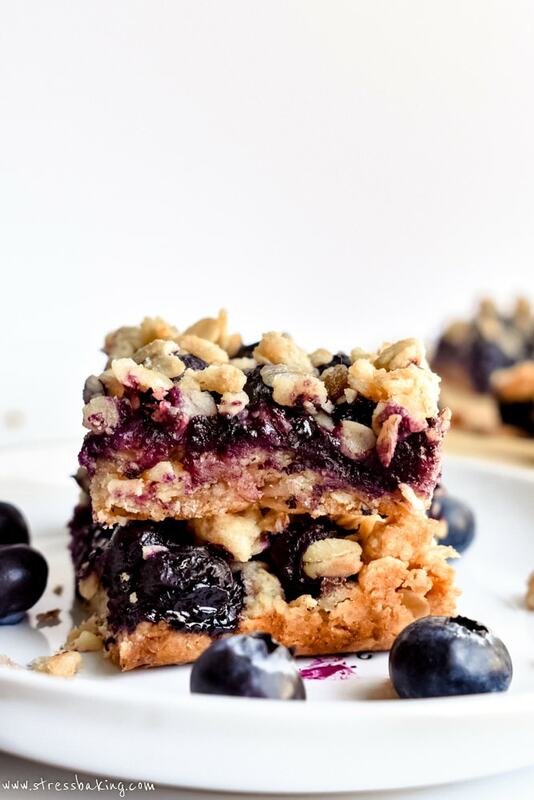 I really like snack bars and the blueberry oatmeal bars would be perfect for my after workout snack. I’m saving this recipe. Oh my goodness I love blueberries. They have such a great flavor. I know this is a great recipe for a fantastic treat. These look so juicy and so tasty! Perfect idea for breakfast on the go, or for a post-workout snack! Can’t wait for the blueberry season to start again! Definitely ate these after a run more than once! I literally just drooled when looking at your photos (gorgeous by the way! )…I need to make these! And I agree that blueberries and lemon go together perfectly! Thanks for sharing! Thank you for the kind words, you’re so sweet! Leslie, I laughed out loud reading this post, and love your proposed fruit name changes! 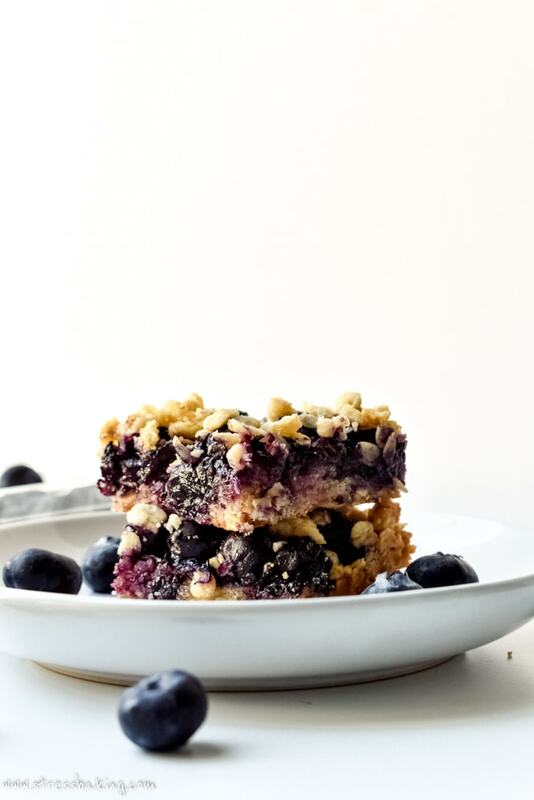 As for these purpleberry oatmeal bars, they look fantastic. 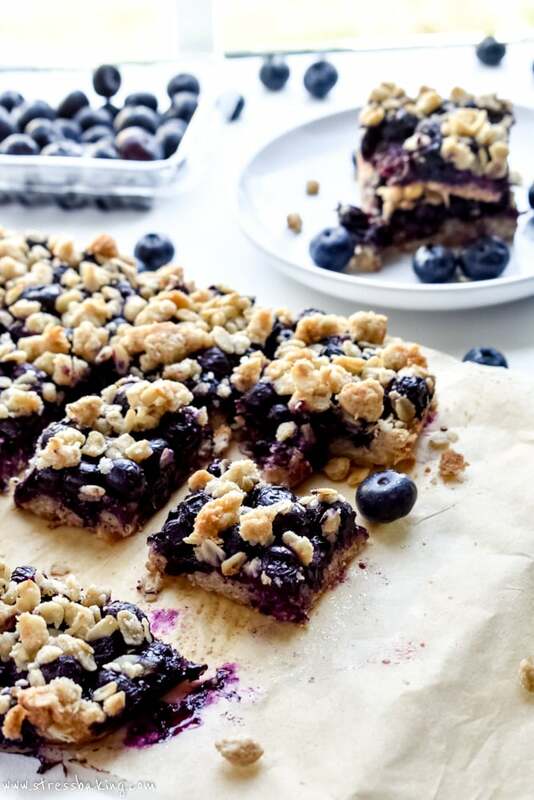 Those juicy blueberries are just calling my name! I’ve always been a total sucker for crunchy, crumbly toppings! And sweet, juicy blueberries (sorry — purpleberries!) are definitely the perfect complement to that. 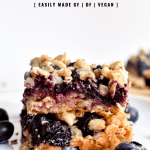 🙂 I’m totally making these bars next time I need a yummy dessert or sweet snack! 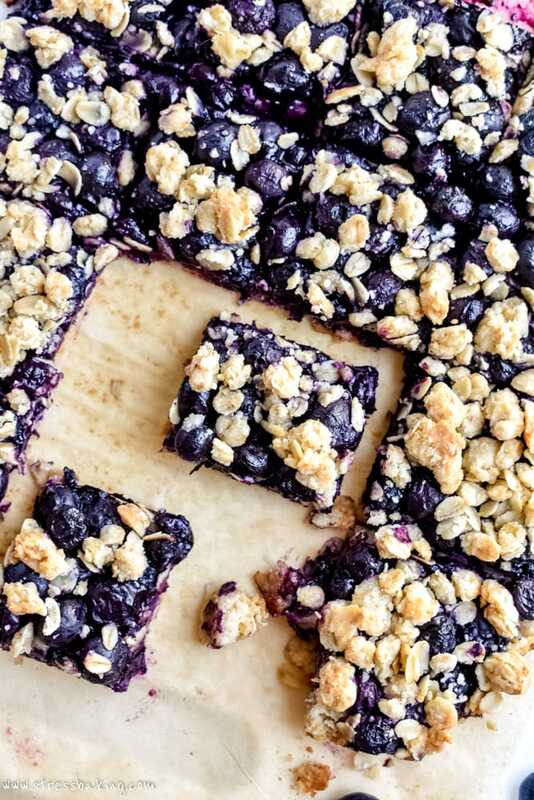 I can’t wait to make these bars after a sunny afternoon of blueberry picking! Thanks for the great recipe! Yes, yes and more YES! This is the type of dessert I could eat non stop. There’s something magical about blueberries as they cook down into a jam!